On Tuesday, July 25, Federation representatives presented the 300,000th local PJ Library book to 6-year-old Nathaniel Melville of Scotch Plains in a ceremonious event. PJ Library, an initiative of our Federation in partnership with the Harold Grinspoon Foundation, has been delivering free Jewish children’s books and music CDs to Greater MetroWest families for almost ten years. Every month, each participating child ages 6 months to 7 years, receives a carefully selected age-appropriate item, along with a parent guide with tips and resources. Over the past ten years, Greater MetroWest PJ Library has reached more than 6,000 families and almost 10,000 children. Currently, 3,191 children from 2,522 families are participating. The ceremonial 300,000th book was presented to Nathaniel by Maxine Murnick, a major supporter of the Greater MetroWest PJ Library program and a member of the Federation Board of Trustees; Federation’s Vice President of Jewish Learning and Life Jody Hurwitz Caplan; Federation CEO Dov Ben-Shimon; Federation Chief Jewish Learning Officer Robert Lichtman; and Federation’s PJ Library Director Andrea Bergman. With Nathaniel at the presentation were his mother Lisa, father Philip, and brothers Gabriel and Jacob. “Nate is always excited to receive his PJ Library book in the mail, and he loves getting mail addressed to him,” said Lisa Melville. “He is engaged from the moment each book arrives. As a mother and a professional who works with children, I value that greatly. We have a large collection of PJ Library books that Nate and his 12-year-old brother Gabe have received over the years. I’ve taken them to school when asked to read about a Jewish holiday or lead a holiday activity, I put them out when we have holiday gatherings at our house, and I bring them to synagogue during services. Not only do the Melvilles receive the books each month, but they also participate in a number of Federation family programs, including once serving as a Family Connector and attending family events like Popsicles in the Park. 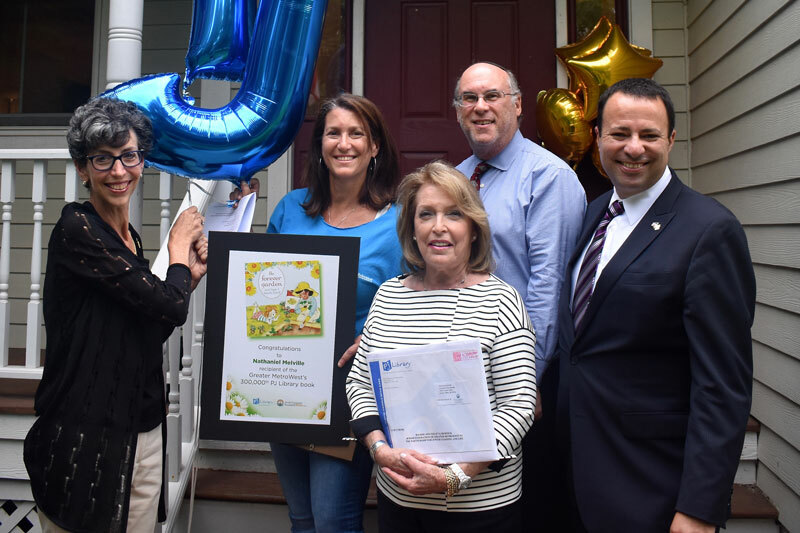 PJ Library is made possible in Greater MetroWest by the generosity of several philanthropic families and individual donors to Federation’s Annual UJA Campaign. For more information about our PJ Library program, click here. For an article detailing recent survey results highlighting the impact of PJ Library locally and nationally, click here.